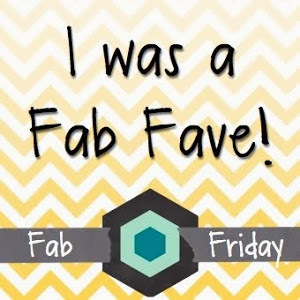 New-Pals Paper Arts blog challenge! 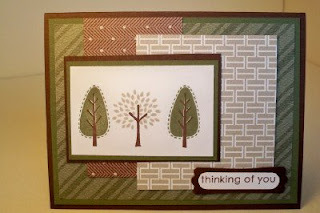 Because I had to play with this new Pals Paper Arts blog challenge here, I'm posting twice today. 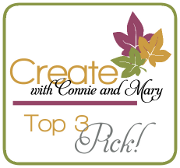 One of my favorite blogs for Stampin' Up inspiration is Mary Fish's Stampin' Pretty here and she's one of the design team members of PPA. I'm gradually warming up to Bermuda Bay and this challenge helped me appreciate the color even more. 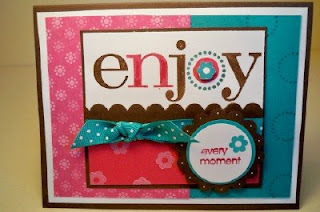 I chose my Enjoy Every Moment stamp set for this card. 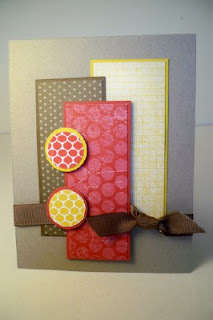 I used one of the circles to create my own patterned paper in Bermuda Bay since I don't have any yet. And inking up the "enjoy" stamp with the new In Color markers was awfully easy too. 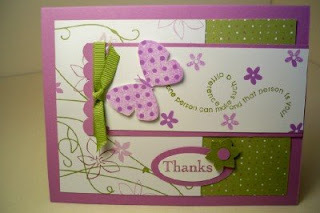 I also used the small flower stamp and White craft ink to put the pattern on the Melon Mambo paper under the ribbon. Another card for this sketch at Splitcoast. I decided to go mono-chromatic for this one and use the Really Rust patterns designer papers from the Level One hostess set. 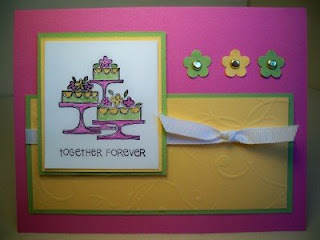 I also used the One of a Kind stamp set and the coordinating Boho Blossoms punch. 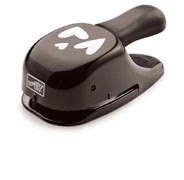 This punch is awesome and helps make quick use of punching out stamped images. I made this card when I first got my Razzleberry Lemonade papers because I'm trying to use each side of the designer papers to show it's versatility. 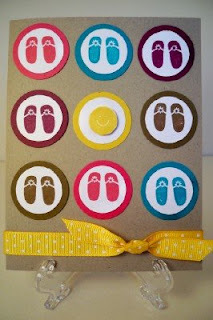 I used the Cheep Talk and Circle Circus stamp sets that are both also very versatile. It's Tuesday and that means another color challenge at Splitcoast here. This one uses Certainly celery, Pixie Pink, Apricot appeal and a neutral of choice. I needed a wedding card so I used the stamp from Fun and Fast Notes. 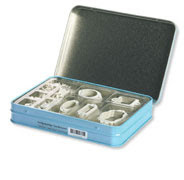 This is really great set if you're on a budget and want lots of options from one stamp set! 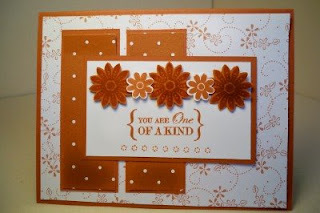 I dressed up the Apricot paper by running it through the Big Shot with the Stampin' Up Backgrounds 1 texture plate. It's Monday and that means another sketch at the Mojo Monday blog here. Obviously, I have the Christmas in July mojo going on. And once again, using my favorite color, red. Only another 79 more Christmas cards to make. You're going to LOVE our Heart to Heart punch, especially July 27-31 when it's just $10.99—that's more than 30% off the regular price of $15.95!Throughout July, be sure to check my web site every Monday at 10 AM (MT) for the week's new deal. 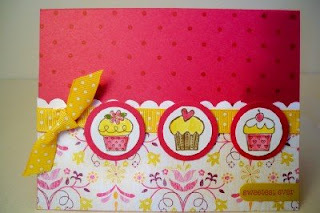 This punch coordinates with the Love You Much stamp set on page 44 of the 2009-2010 Idea Book and Catalog. Contact me with any questions or to place an order! Another take at this week's Stamping 411 sketch. This one went pretty quickly too. The most time-consuming element was stamping the flower three times, once on the base white square, then on a scrap in Soft Suede and then a third time on a scrap in Ruby Red. And then cutting the two out and lining them up and adhering them. These papers are from the Prints Pack III hostess set. 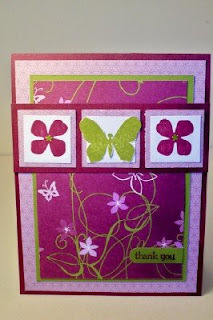 I used the Flight of the Butterfly stamp set with the Cottage Wall Designer Papers on this thank you card. I think this stamp set compliments these papers really well. I used the "stamping off" technique on both the butterfly and the little flowers. All you do is ink up your stamp, stamp it once on some scrap paper, then stamp the image again as normal. It gives your projects a little depth, yet the colors still coordinate. 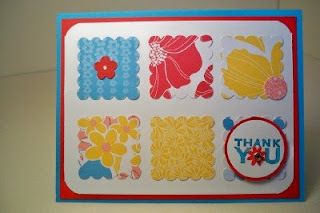 I needed some thank you cards for my new teenager, Abby's birthday gifts so I made this quick and easy card with the Pink Flamingo designer papers. 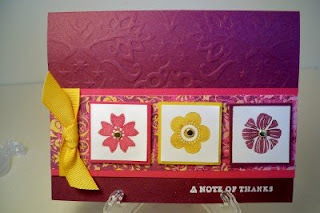 I also used the Wow Flowers stamp set for the thank you image. I just punched out a bunch of coordinating papers with the scallop square punch, inked up the stamp with Tempting turquoise and Real red markers, punched that out with the 1 1/4 in circle punch, layered that onto a 1 3/8 in circle punched with Real red, used a yellow Circle Fire Rhinestone brad in the center and adhered with Stampin' Dimensionals. Oh, and I also punched a Real Red flower with the Trio Flower punch and added a dot with a White gel pen. I'm at it again! 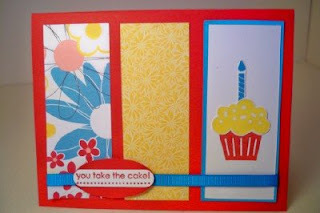 I made a card for another Splitcoast Stampers Card Sketch here. 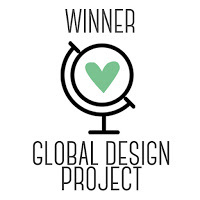 Easy-peasy to just print out the sketch and measure, cut and create accordingly! I'm trying to use each design of all my designer papers while I wait to be able to pre-order from the Holiday Mini on Aug. 1st (another perk of being a demo). 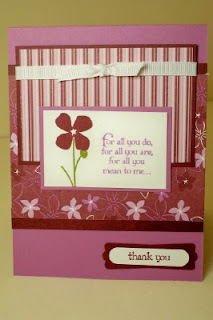 I used the Stampin' Up Backgrounds 1 texture plate on the top part of this card. I thought that design coordinates perfectly with the Razzleberry paper. Here's my take on this Mojo Monday week #96 sketch. I can always use birthday cards so I made another one. I'm also loving The Write Stuff Specialty papers. 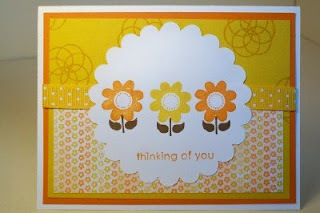 I could have used one of the big flowers from the die-cuts but I tend to hoard my papers and die cuts. I used the Scallop Circle #2 Bigz die instead. 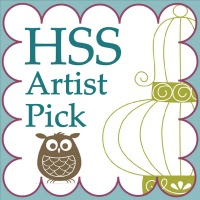 Our Styled Vanilla Hodgepodge Hardware adds class to any project. Get them for just $18.99 (over 30% off the regular price of $29.95)—only July 20-26!Throughout July, be sure to check my web site every Monday at 10 AM (MT) for the week's new deal. Check out my web site here for more info or to place an order. 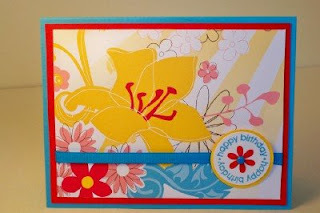 I made this birthday card for another Stamping 411 challenge here. 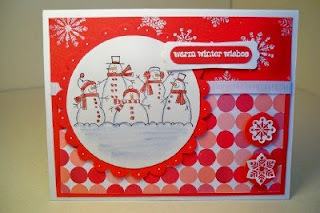 One of my cards was picked as a top 5 for Stampers Showcase sketch #107(see my July 11th Christmas card). Whoo-hoo! These sketches are just a breeze and fun to play along with too. 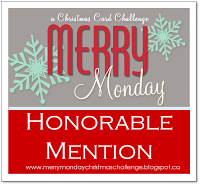 I had three, self-imposed objectives with this card. One, to use stamp sets that have been neglected lately. Thus, I used Trendy Trees. Two, to use only current designer papers (and do I have LOTS of retired stuff-I'm a paper hoarder). So I used To the Nines Specialty papers. And three, to make more masculine or non-flowery cards. I think I covered all three! This stamp set should be used with the Stamp-a-ma-jig too. It lines things up just right. 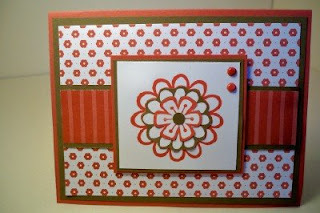 I made another card with the Cottage Wall Designer Papers. I also used this sketch from Splitcoast. I can't say enough how easy these are to follow! I really like this Cottage Wall dsp, even though I'm not a big purple fan (as my Mom can tell you)! I think she'll be getting some creations with this paper for Christmas presents-she's a HUGE purple fan! It's my daughter Abby's 13th birthday today so I had to share a bright, cheery, funny, lovable card just like Abby! Her sister, Megan, her aunt, Nene, Abby and I are going to see Taylor Swift tonight so it ought to be a fun night. The card was super easy to make. Just 2 pieces of Pink Flamingo dsp, some layered card stock, some images from Party Hearty and it's all set. Happy 13th birthday Abigail Kathleen! Razzleberry get well card made for Splitcoast sketch #237 here. These sketches are just great to do. 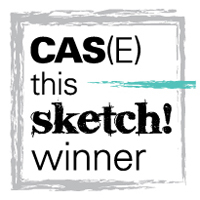 You can print out the sketch and it prints out exactly to the size of an A2 card. Just a little bit of paper trimming and you can make a really cute card pretty quickly. I just love the Teeny Tiny Wishes set! There is an endless number of occasions. I figured it was time to make a card with Dusty Durango. This new In Color has probably been the most neglected so far. Hopefully I'll make some more with this color as fall approaches. This was a super quick and easy one too. I used the leaf stamp from Petal Pizzaz and randomly stamped that in Dusty durango, Soft Suede and Crushed curry on Whisper white cardstock. Then just layered that on a piece of Soft suede then Dusty durango. I LOVE the Dusty durango polka dot grosgrain ribbon. I finished it off with a Curry scallop circle and embossed the acorn/thanks stamp with white craft ink and white embossing powder. I'm outta my comfort zone with these colors. But that's good cuz challenges are good for just that! 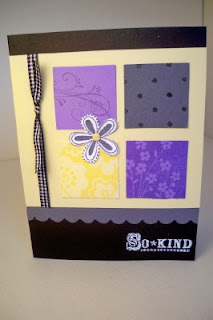 I made this card for the Splitcoast Color Challenge #227 here. I didn't have any Going Gray card stock so I substituted Basic Gray. I made a "manly " card for this Mojo Monday sketch. 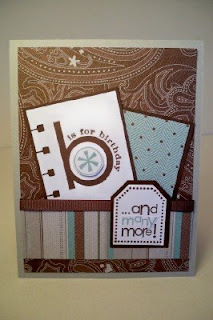 I'm always looking for good ideas for masculine birthday cards and I think this one with the To The Nines Specialty papers and Party Hearty stamp set fits the bill! I just left off the bow from the sketch and this is ready to go! 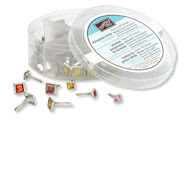 Add sparkle to your projects with our Square Fire Rhinestone brads. From July 13–19, they're just $6.99—over 30% off the regular price of $10.95!Throughout July, be sure to check my web site every Monday at 10 AM (MT) for the week's new deal. 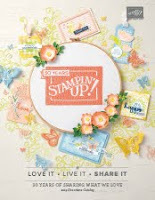 Check out my Stampin' Up web site here for more details or to place an order. I got a sneak peek of the Holiday Mini today. As a demo we get to pre-order from the publications. 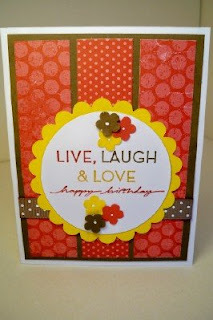 I can't wait to show you the new papers, ribbons, punches and cute stamp sets when I can order in August. Everyone else can order beginning September 1st. 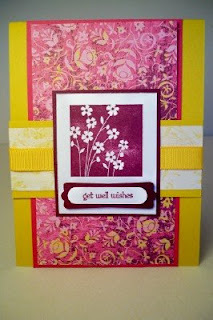 First, this challenge for Stamping 411. And then this challenge on Splitcoast-Christmas in July. I'm a Real Red girl at heart and had to have this new 3/4 inch polka dot grosgrain ribbon the minute I saw it in the new catty! I really love the Christmas Punch hostess set too cuz there are so many cute images you can just ink up and punch right out! on Splitcoast. I'm really inspired lately by all the challenges out there. This card literally took me less than 10 minutes to make. I just layered a piece of real red cardstock on a 4 1/4 by 8 1/2 sheet of tempting turquoise. 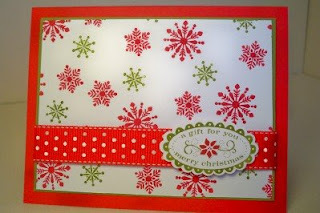 Then I used a design from a piece of the Pink Flamingo designer series papers on top of the real red. The only stamping was the Happy Birthday circle from Think Happy Thoughts in turquoise then the real red flower in the middle. I put a turquoise brad in the middle then a piece of turquoise 1/4 inch grosgrain ribbon and it was done! 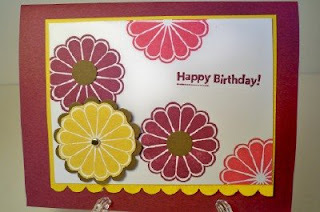 I'm just enjoying making cards with some new papers I ordered from the '09-10 Idea Book and Catalog. These papers are from The Write Stuff Specialty papers. They're a little different in that you get 2 sheets each of 3 double-sided designs then 3 die-cut sheets of coordinating designs. I think this card could be used for just about any occasion-just stamp what you need on the inside and you're good to go. My order from the new 2009-2010 Idea book and catalog arrived today. But I didn't get to play til late tonight. I used this sketch challenge from Splitcoast. I really like all the different designs in the Cottage Wall Designer Series papers. It's a bit outta my color zone but that helps me be more creative. I already have lots of ideas for gifts for Mom-purple is her favorite color! I'm on a roll with two posts in one day! 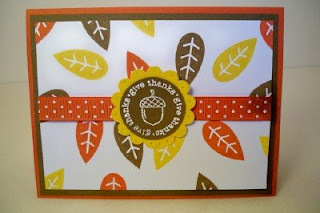 Here's a card I made for this Stampin 411 challenge. This card took less than 10 minutes to put together. I'm slowly getting into the new In Colors and the Razzleberry Lemonade paper is growing on me too. 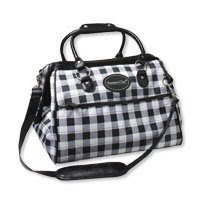 You'll feel like a big shot carrying around the Big Shot Doctor's bag! July 6-12, get the Big Shot Doctor's Bag for $49.99. That's nearly 30% off the regular price of $69.95!Throughout July, be sure to check my web site every Monday at 10 AM (MT) for the week's new deal. 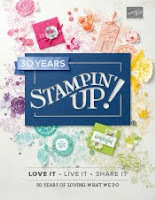 See my Stampin' Up demo business website here for more details or to place an order. My order from the new 2009-2010 Idea book is scheduled to arrive tomorrow. I can't wait to play and show you some more samples with my new goodies! I thought I'd share some 4th of July cards I made to give to my family. They're pretty cute if I do say so myself! Thanks to all our military men, woman and families for all their sacrafice! We couldn't celebrate this day without them! 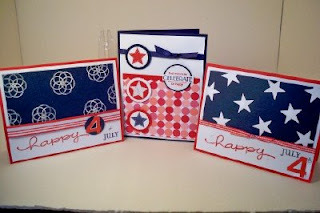 All three cards use Whisper white, Real Red and Night of Navy papers and inks(with two of them also using Whisper White craft ink & white embossing powder). Card descriptions are from left to right. I'm on a roll! I made this quick and cute card for a Splitcoast Sketch Challenge. See here. This can be used for just about anything-a thank you, get well, thinking of you, birthday, etc. It came together super fast using the 1 inch and 1 1/4 in circle punches. 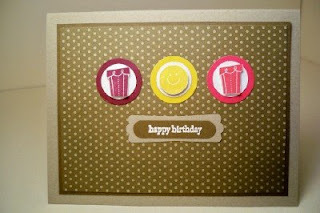 I popped up the sun with a Stampin Dimensional and added the darling, Crushed Curry polka dot grosgrain ribbon. 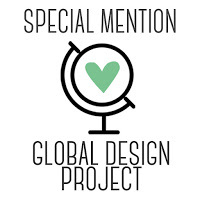 2009-2010 Idea Book & Catalog is HERE! The 2009-2010 Idea Book & Catalog is here. Some great new In Colors as I've been previewing. I just put in an order this afternoon so can't wait to play with more new stuff! 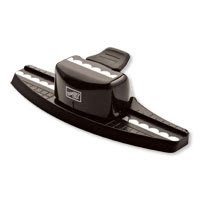 Also a great promotion from JULY 1-5th: Scallop edge punch for just $10.99-over 30% off the regular $15.95 price! 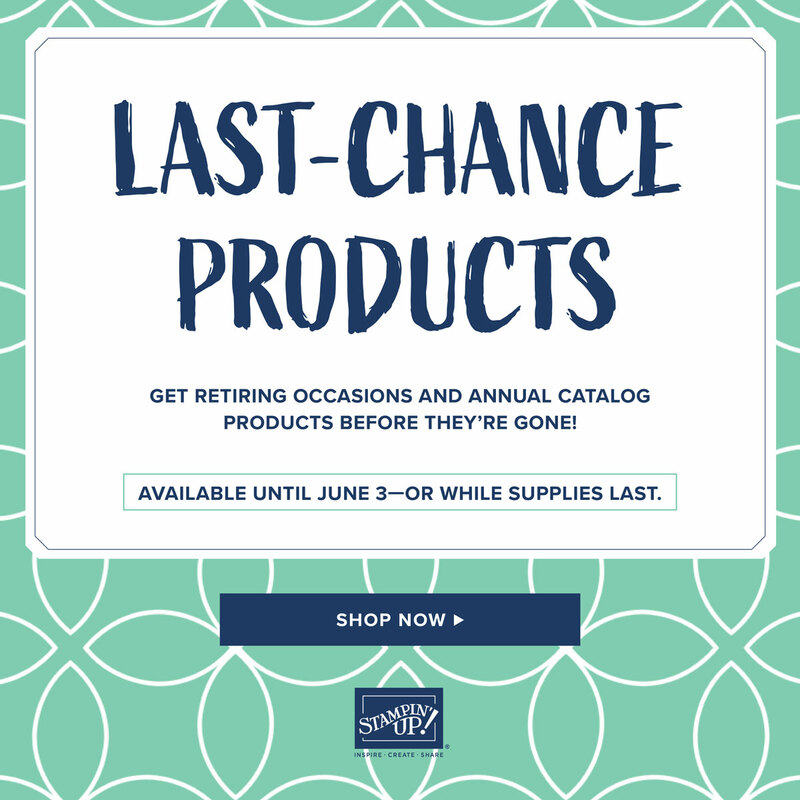 Check back for the Summer Fun promotion NEW every week thru the month of July. Here's a card I made for my Mom's birthday with the new catty goods. Notice, I used the scallop edge punch that's on sale too.